I must boast. My teen leaders have really stepped up and are getting involved in much more than the Teen Science Café at our Museum of Forestry. The leaders went as a group to our local Lake Waccamaw “Safe Night Halloween” Festival and volunteered to scare people all evening at the haunted house. 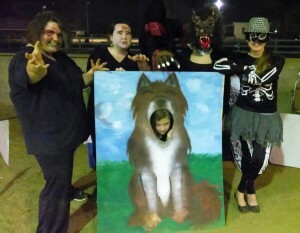 We also had a carnival booth with a game and face painting manned by the teens and myself. 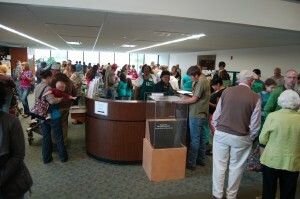 3000 people came through this event, and we had fliers and posters advertising the NC Open Minds Teen Science Café. We are getting our name out there! 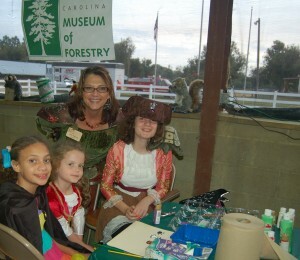 Mother Nature (Vicki DiMuzio) and her helpers at the face painting table. For the annual Pecan Harvest Festival in Whiteville, we had a Wildlife Encounters program here at the Museum, which brought in 2300 people. Again many of my teen leaders came and volunteered to help us, and we had a table with our poster and fliers of upcoming Cafés out for all to see! What a difference this makes in our small community and Museum to have the teens active in these programs!